H.G.Wells, The Island of Dr Moreau. Penguin first edition, 1946 (no. 57). From my phase of collecting Penguin firsts, and I’m sure I also have a copy of The Time Machine somewhere. The white on orange stripe is still instantly recognisable, but does it tell us anything about the book? Admittedly, in my Penguin collecting I cared little for the authors in question and only wanted to fill the gaps in the numbers 1-200. I can’t name all of the authors or all of the titles, and I must confess I’ve read none of them. In the 1960s Penguin began to get a little more daring. It was the cover of this book that inspired me to want to read it aged 14. Although the 60s were long gone by then, I still found something adult, daring, even promiscuous in this cover. Edna O’Brien, Girls in Their Married Bliss. 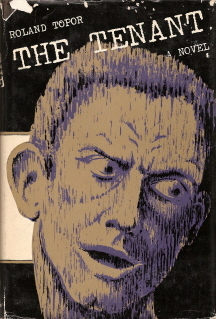 Penguin (1967). This is the first in an occasional series. I’ve been sorting through some old books recently and have rediscovered what are, in my opinion, some examples of classic and memorable cover designs. The Tenant by Roland Topor. W.H.Allen London (1966). Jacket design by Ron Clark. Topor’s novel tells the story of a man called Trelkovsky, who rents a flat in Paris. He slowly goes mad, haunted by the previous tenant of his rooms who jumped to their death from the window, and by the fellow lodgers in his apartment block, who he is convinced are out to get him. My first exposure to The Tenant was via Roman Polanski’s 1976 film. It’s weird, disturbing, has some very dark humour that you’d expect from Polanski and, in my opinion, is something of a forgotten classic. 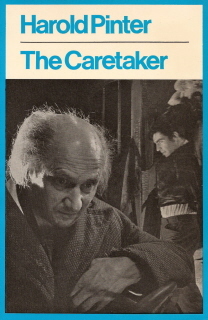 No doubt I bought the novel on the strength of the film, wanting to endure Trelkovsky’s torment first hand. I love this cover because the artwork conveys to me exactly Trelkovsky’s despair. You can also see the hint of the beckoning open window behind him. It also hints at exactly what this book is about; if my short synopsis has put you off, the cover of the book undoubtedly will also. I’ve owned a copy of this for so long that I can’t remember where it came from. Stamped on the inside back cover is City of London Wood St. Police Library. Pencilled on the inside front cover is 20p, although I’ve just seen a copy of this for sale on Amazon for $30. It’s the British first edition, although my copy is a little worse for wear. Often I forget what my books look like; trapped for years in a bookcase they only make their spines visible. I’ve moved house many times in the past 20 years; the cover of The Tenant revealing itself in snatches as it is packed into a box where I’ve often wondered if, unlike Trelkovsky, I was making the right move.